April 11, 2012 - PRLog -- Instead of building new hospitals that import old systems and problems, the time has come to reexamine many of our ideas about what a hospital should be. Can a building foster continuous improvement? How can we design it to be flexible and useful well into the future? How can we do more with less? Answering these questions and more, Lean-Led Hospital Design: Creating the Efficient Hospital of the Future explains how hospitals can be built to increase patient safety and reduce wait times while eliminating waste, lowering costs, and easing some of healthcare’s most persistent problems. It supplies a simplified timeline of architectural planning—from start to finish—to guide readers through the various stages of the Lean design development philosophy, including Lean architectural design and Lean work design. It includes examples from several real healthcare facility design and construction projects, as well as interviews with hospital leaders and architects. Naida Grunden is a Lean healthcare consultant and has been a business and technical writer for over 25 years. She speaks and teaches nationally and internationally (Denmark, Cuba) on the application of Toyota-based Lean techniques in healthcare. Her clients include Captain Sullenberger, Pittsburgh Regional Health Initiative, Healthcare Performance Partners, and Global Link. Grunden is the author of The Pittsburgh Way to Efficient Healthcare published by CRC Press. She was also responsible for launching the PRHI Executive Summary, a monthly newsletter published by the Pittsburgh Regional Health Initiative, when she was Director of Communications. In Grunden received the 2006 Challenge Award from the American College of Clinical Engineering for her article, "Industrial Techniques Help Reduce Hospital-Acquired Infection," in Biomedical Instrumentation and Technology magazine. She has published numerous articles for various healthcare publications and was the keynote speaker for the HIMSS 2010 Conference awards breakfast. Grunden completed her BA in English at California State University, East Bay, and her secondary English teaching credentials at California State University, San Francisco. Charles Hagood, MBA, President and Founder of Healthcare Performance Partners (HPP), has overseen the introduction and implementation of Lean Healthcare systems in numerous healthcare organizations including some of the largest non-profit hospitals, national systems, small critical access hospitals, clinics, and large for-profit systems. HPP is one of the few organizations that have successfully translated Lean manufacturing and the Toyota Production System (TPS) to the healthcare industry. Charles also is a founding Principal of The Access Group, LLC (TAG), which is headquartered in Nashville, Tennessee USA area along with HPP, and has worked with Fortune 100 companies throughout the world (GE, Tyco, Cessna, Nissan and many others) in their Lean transformation and process improvement initiatives. Charles also oversees the application of Lean/TPS methodologies into the planning, design, and construction phases of a wide range of clinical and hospital renovation and construction projects. Charles speaks throughout the USA and Europe, and most recently China, on the subject of Lean Healthcare and the application of Lean and other process improvement methodologies to healthcare industries. Charles is the founding faculty member of the Lean Healthcare Certificate Program at Belmont University. In 2003, Charles was awarded the State of Tennessee’s top award for his work in Economic Development by the Tennessee Economic Development Council. In 2008 he was recognized as Alumnus of the Year by the Belmont University Massey School of Business. Charles received his MBA degree from Belmont University. There are tens of billions of dollars being spent on construction of new healthcare facilities in the U.S. today. Before spending another dime healthcare executives should read this book and learn how it’s possible to take as much as 40% of the building cost out before a shovel ever goes in the ground. This result has now been proven over and over by many healthcare organizations on the Lean transformation journey. As a bonus, but even more importantly, we can improve staff satisfaction and clinical quality at the same time as the cost goes down. Naida Grunden and Charles Hagood beautifully document these outcomes by the use of real case studies in addition to her own extensive experience as a careful observer of Lean healthcare. Leading Lean hospitals have learned they need more than ongoing continuous process improvements. Given the chance to build new or expanded facilities and space is a unique opportunity to build in efficiency and patient-centered care from the start. 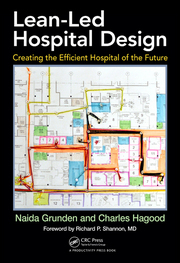 Lean-Led Hospital Design is a fantastic book that shows the reader exactly how to incorporate process design with space design in a collaborative and iterative manner. The vivid examples shared by Naida Grunden and Charles Hagood bring these principles and practices to life. This book will help your organization immensely, whether you are just starting to plan for a new facility or whether you are ready to move in. Naida Grunden, author of The Pittsburgh Way, and Charles Hagood have nailed an important oversight in Lean and other industrial engineering applications in health care. Too little attention is focused on the role of the environment and physical plant in making exceptional performance possible. Would a world-class symphony perform in a substandard hall with poor acoustics, uncomfortable seats, audible distractions and visual impediments? Excellent case studies demonstrate how health facilities can be designed to advance safety, clinical quality and efficiency. This book argues effectively that performance excellence must be aligned with a supportive physical environment. Hagood and Grunden have engaged one of the most complex and important subjects facing our great nation. This generations place in American history is taking shape and in no small part will be valued on how we responded to the health care cost crisis. This book provides useful insight as to how we can design care that fulfills its obligation ‘to do no harm’ and yet provide it in a cost effective manner. ISBN: 9781439868287, March 2012, 338 pp.